I’m picky about garden gloves, when I do wear them. Usually, I’ve bought the Grip Gloves, a coated knit glove by Canadian glovemaker Watson Gloves, from Lee Valley Tools, Canadian Tire or, lately, from Mark’s Work Wearhouse. Cheap and cheerful, at less than $10 a pair. But back in 2010, a swag bag from the Garden Writers’ Symposium in Dallas included a pair of Jubilee Ethel Gloves. As I’d read raves from folks who love their Ethels, I gave them a try. 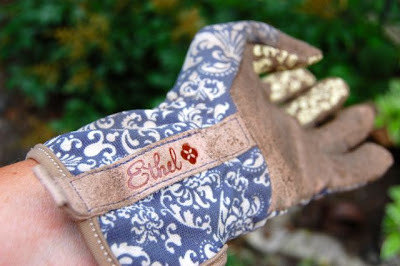 Three years later, Ethels are still my go-to garden gloves. Ethel was our maternal grandmother’s name. “Effie” was a huge gardening influence on Sarah and I, so it’s fun to sport her name around the garden. Besides that, I like a few things about Ethels. First, are the reinforced fingertips. With weeding, pinching and poking holes, my middle and index fingers tend to pierce coated gloves by the end of a season. That means disposing of a pair a year; two, if I’m lucky. So far, the Ethel gloves have not given me the finger(s). The synthetic suede is enough without being thick and unwieldy. That increases the likelihood that I’ll actually keep the gloves on my hands. Which is a plus, for gloves. The same material reinforcing the palms offers protection for medium-weight garden chores. I’ve also washed my gloves (perhaps not as often as I should), and the leather portion now molds to the shape of my hand. These will get me through another year, at least. Not bad for durability. For roses and other thorny work, I wear long-sleeve, synthetic leather West County rose gloves snapped up two years ago at a ridiculously low sale price at the Toronto Botanical Garden. They’re still going strong, albeit without day-in-day-out use. Wish I’d bought two pairs while I had the chance. 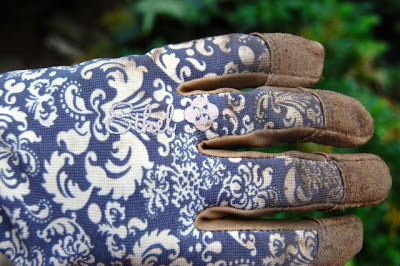 For other ideas, check out Sarah’s post on her garden glove preferences from back in 2009. Then tell us about your favourite garden gloves. Or whether you prefer to go au naturelle. Over the years, I have discovered that a supple leather gardening glove works best for me and my employees. Because I use them in great numbers, finding an affordable men's version was a frustrating challenge until I stumbled upon the Terna brand at Costco. Sadly, a women's version of this glove is not offered and my female employees suffer with whatever well -priced but inappropriate-for-heavy-duty-work women's glove Costco has to offer. Thanks for adding to the discussion, Allan. As a landscape professional, you probably have tougher requirements for gloves than the average gardener – although many of us have to haul brush occasionally. Women's gloves *are* hard to find. Some of the more fashionable ones I find impractical. For example, Foxgloves, which come in pretty colours, are all cloth; perhaps okay for protecting a manicure, but not very comfy when wet. However, gloves like wallets can be a very subjective choice. From a gardener in Nova Scotia. I too love the Ethel gloves and for all the same reasons. I inherited my gardening genes from my mom and her middle name was Ethel. Makes them extra special. I am a transplanted Upper Canadian. I love your blog even though it can make me a little homesick. Donna, Thanks for visiting the blog… if you ever find yourself visiting your old haunts, let us know. And let's hear it for the gardening Ethels in the world. Maybe that great old name will start making a comeback. I tried on some Ethels at the store once. They just felt like I was wearing a potholder. I like the Atlas gloves …skin fitting. For hard work like hurricane clean up or the like, I have a pair of leather gloves I 'borrowed' from my mom when we cleaned up after Hurricane Irene. Haven't had to put gloves to the hurricane test yet, Janet. But I hear you. Gloves can be a highly personal choice.